Home > Membership > Nonprofit World > Are Children Really Our Future? Or Do We Need New Perspective? 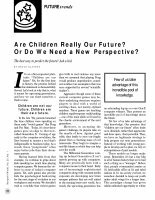 Are Children Really Our Future? Or Do We Need New Perspective?